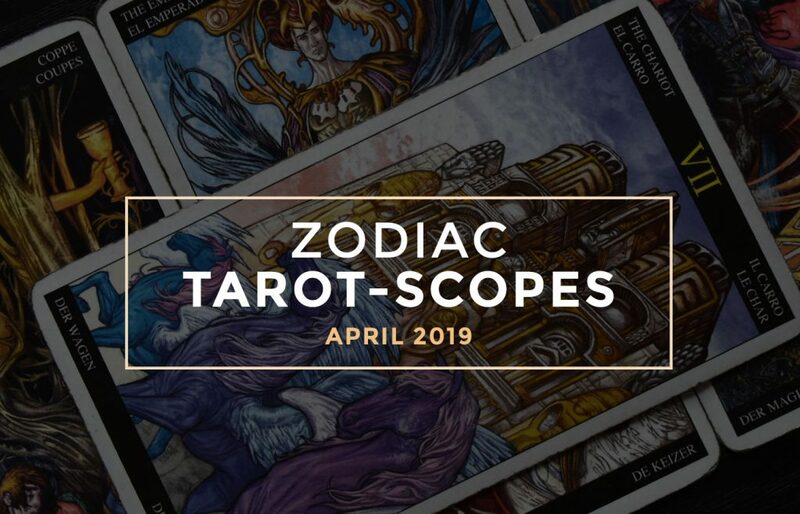 Take a look at this month’s tarot-scopes. If you need to learn more about what it is, you can click here. As a reminder, this is just a general overlook throughout the month. Some of the cards will resonate with you and some won’t. If you want a more personal reading, you can book me. Have fun with the cards and take any negatives as a caution or warning. Ultimately, it’s your choice to do whatever you want with the information provided. Emperor: As the 1st sign of the zodiac, Aries has the natural fighting spirit of warrior. This card is associated with Aries, and rightfully so. Aries and the Emperor depict an individual who has the perseverance, determination, and the stamina to rule the world. Both are confident, fearless, brave, and even insensitive. They think primarily with their head, such as the Ram, though they are both very passionate and fiery underneath. 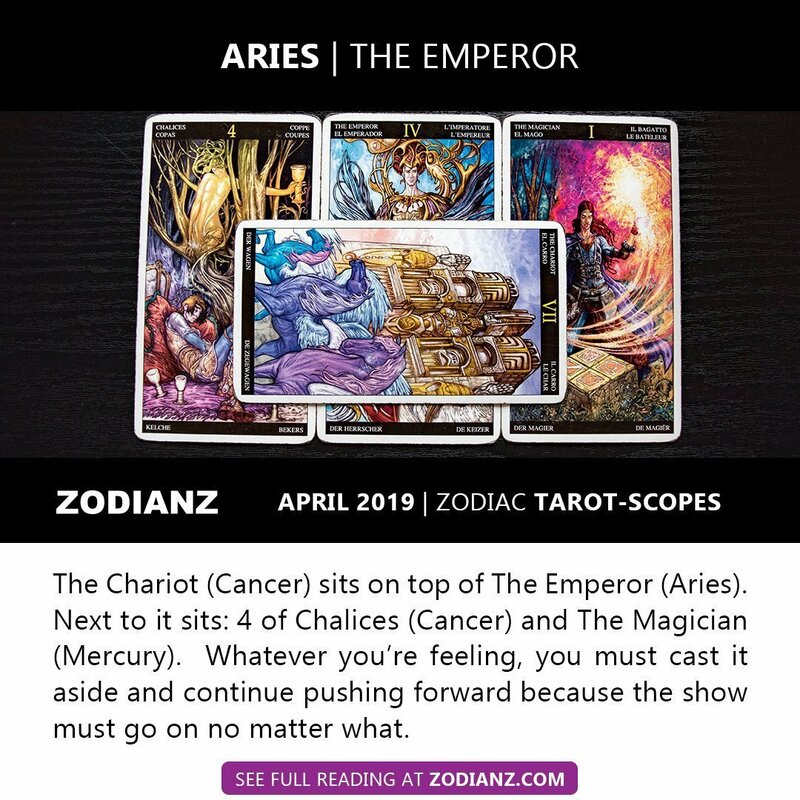 The Chariot (Cancer) sits on top of The Emperor (Aries). Next to it sits: 4 of Chalices (Cancer) and The Magician (Mercury). Whatever you’re feeling, you must cast it aside and continue pushing forward because the show must go on no matter what. …the show must go on no matter what. The Chariot crosses and compliments you, letting you know that you’ll be in your feels all month long (good and bad). There is a sense of wonder and motivation, a sense of family and intimacy. However, the 4 of Chalices predicts that you’ll also be hiding under a mask. Regardless, the show must go on no matter what. This may also not be the right time to unveil how you feel or these issues are so far gone that they just continue to haunt you. Instead of taking it on or projecting that hurt onto others, why not try a different, more creative method? The Magician encourages you to recycle your negative energy and make something productive or magical with it. This is also a good time to be creative and to motivate others by showing them how to overcome their past wounds through healthy activities. To book a personal reading, click here. The Hierophant: This card is associated with Taurus. Like Taurus, this card depicts a nurturing, knowledgeable, dedicated, structured, stable and responsible individual. One whose spirit is linked to nature and energized and grounded by the powers of earth. They are helpful to those who ask for it and they are caring for those who need it. They separate business and personal relationships, ensuring neither gets in the way of what needs to be done. 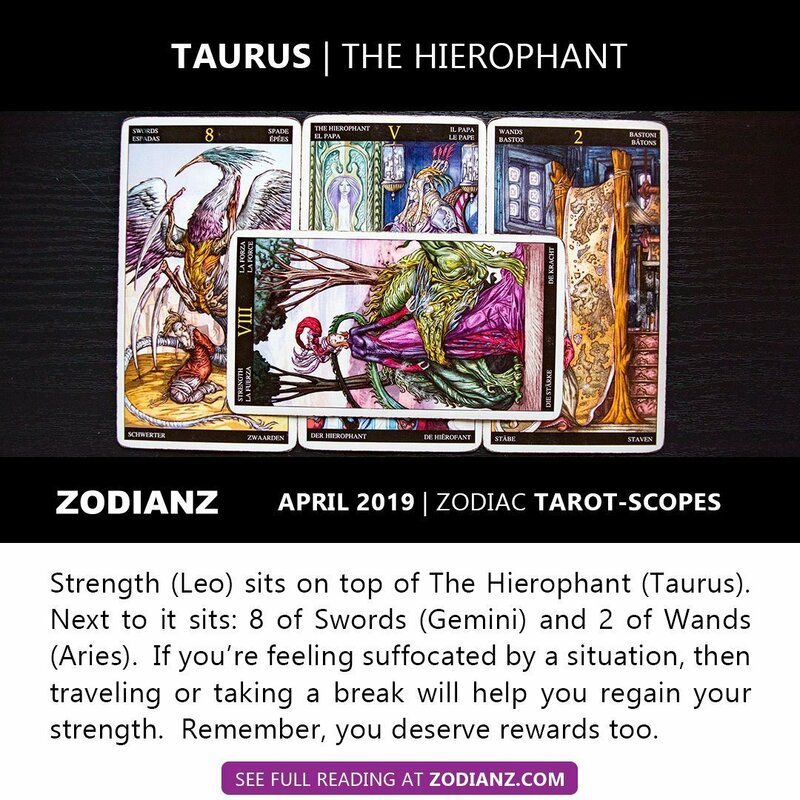 Strength (Leo) sits on top of The Hierophant (Taurus). Next to it sits: 8 of Swords (Gemini) and 2 of Wands (Aries). If you’re feeling suffocated by a situation, then traveling or taking a break will help you regain your strength. Remember, you deserve rewards too. Remember, you deserve rewards too. Strength compliments you, encouraging you to regain your confidence and to literally have strength to push forward. It’s a good time to think about yourself and your needs this month, especially if you’ve been very generous with close friends and family. Half of this month also belongs to your sign, so happy early birthday. Expect a crowd of people flocking to you. Whether it’s good or bad, you’ll feel suffocated by everything and everyone (8 of Swords). If people are gathering around to share their issues with you, then remember to put up boundaries and enforce them. This month is your time to alleviate yourself from any toxic situations. The 2 of Wands also encourages you to explore, travel, or to plan an escape, lol. If you’ve been working hard, then don’t forget to reward yourself and nurture your energy. The Lovers: This card is associated with Gemini and depicts two entities coming together, forming an everlasting bond of two souls, two differing energies, two different perspectives just like The Twins of this sign. There is love for one another, but also the fears of tomorrow coming with it. Love is a powerful energy, one that is also attached with hate. Like the Twins I always refer to in my work: One good and one evil. 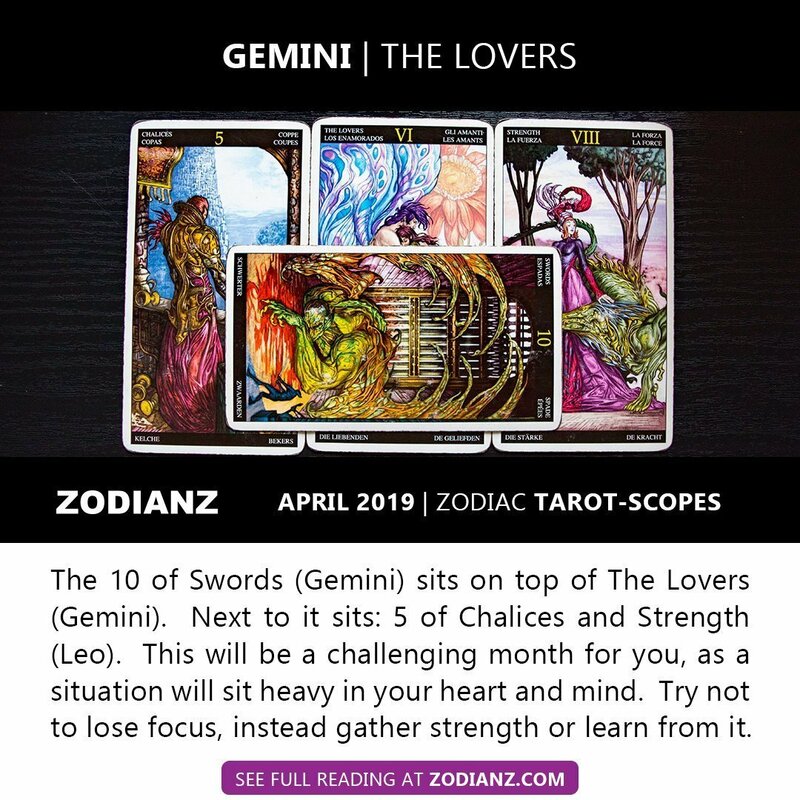 The 10 of Swords (Gemini) sits on top of The Lovers (Gemini). Next to it sits: 5 of Chalices and Strength (Leo). This will be a challenging month for you, as a situation will sit heavy in your heart and mind. Try not to lose focus, instead gather strength or learn from it. This will be a challenging month for you, as a situation will sit heavy in your heart and mind. The 10 of Swords crosses you, warning that destruction will come soon. Either you’re doing it to yourself or a situation will take its toll – or maybe it’s already destroyed. Regardless of what it is, there’s a sense of defeat and/or self-sabotage. The 5 of Chalices predicts that on top of it all you will feel rejected and disappointed either in yourself or the situation. Try not to look for anybody to blame. The Strength card advises you that even though you’ve taken a hit mentally and emotionally, it isn’t time to point fingers or play the victim card. See things from a higher perspective and if you’ve done something wrong, then acknowledge it. Whether you’re right or wrong, acknowledge it and learn from it. VII Chariot: This card is associated with Cancer. Like the sign, this card depicts a loving, caring, family oriented, and devoted individual. Cancer’s take charge and follow their hearts, not their heads. They do whatever is necessary to build a comfortable home and safe space for themselves, always making sure everyone is provided for and are prone to self-sacrificing themselves. The shell is as hard as their heart. 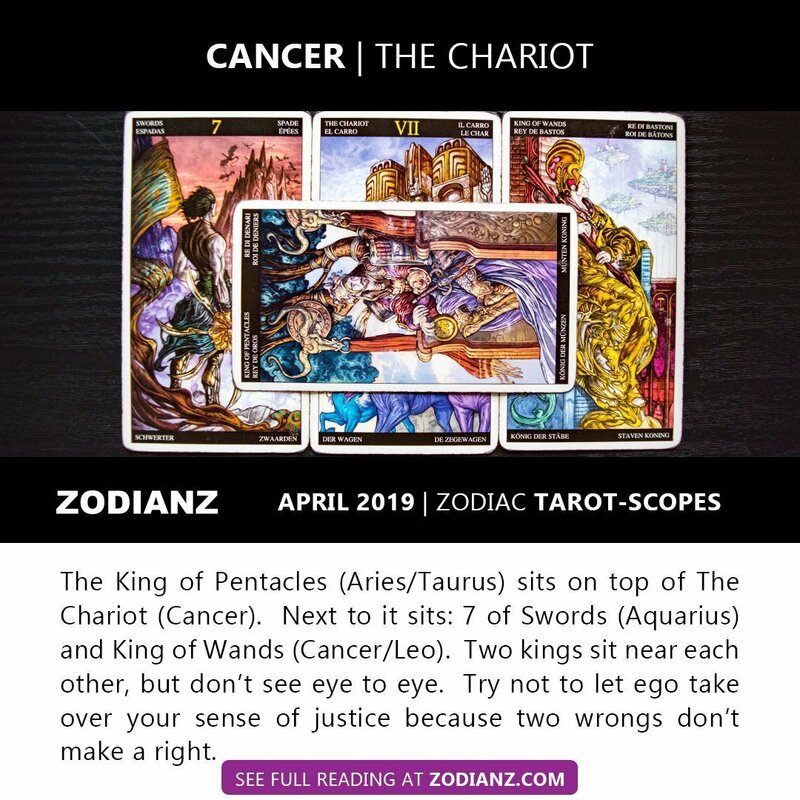 The King of Pentacles (Aries/Taurus) sits on top of The Chariot (Cancer). Next to it sits: 7 of Swords (Aquarius) and King of Wands (Cancer/Leo). Two kings sit near each other, but don’t see eye to eye. Try not to let ego take over your sense of justice because two wrongs don’t make a right. …two wrongs don’t make a right. The King of Pentacles crosses and compliments you, letting you know that money will be on the mind. Notice how he faces upwards, it means that you will be thinking of ways to come up or you’ll be looking for new financial opportunities. Whereas, the King of Wands looks right and away from you. There will be another person that will try and challenge your ideas of growth. This could irritate you but try not to let it get under your skin. Instead, try to see things from a different perspective altogether (7 of Swords). They could be feeling some type of way towards you because they either don’t want you to succeed, don’t think you deserve it, or they want it for themselves. However, try not to let your sensitive ego get in the way of your better judgment. Their insecurities are not yours. Don’t let it deter you from your goals and show them how a boss does it. 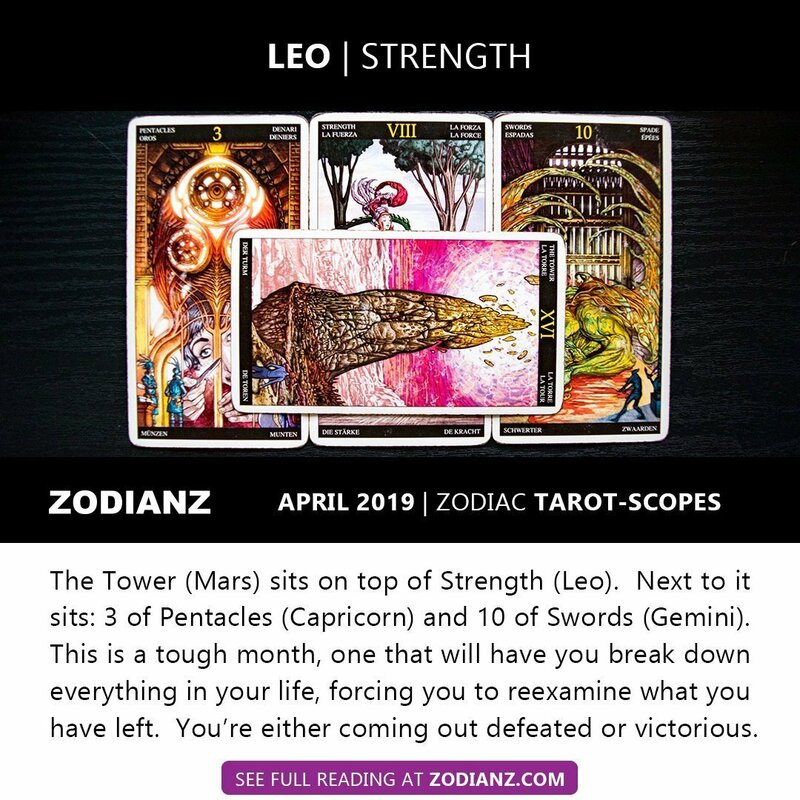 Strength: This card is associated with Leo. Like this sign, this card depicts a mature individual who is daring, ready to beat the odds, mature, experienced and not willing to give up easily. She is glorious, calm, and completely in control of her environment. Leos have a fighting spirit that’s ready to take charge and stamina that won’t let up, but they’re also highly intelligent and know when to pounce on the opportunity. They’ll lay and wait until that time comes, rawr. The Tower (Mars) sits on top of Strength (Leo). Next to it sits: 3 of Pentacles (Capricorn) and 10 of Swords (Gemini). This is a tough month, one that will have you break down everything in your life, forcing you to reexamine what you have left. You’re either coming out defeated or victorious. You’re either coming out defeated or victorious. The Tower crosses you, warning of a breakdown, loss of energy, or loss of a situation or person. It will be quite intense yet relieving at the same time. You may have too much on your plate, as Leos are known to take on more than they can chew. The Universe may be telling you to slow down. The 3 of Pentacles advises you to take a careful and cautious approach to everything and everyone. You may have left all the smaller things for later, and now they’re piled up and overwhelming you. The 10 of Swords predicts defeat or victory in your future, but that choice is yours to make. You will either let things breakaway and accept it was fated to end, or you will hang onto old memories and stay stuck in the bad choices that no longer live. It may be time to release yourself of a bad situation for good, so give yourself permission to heal and move on from it. The Hermit: Like Virgo, this card depicts an individual who is educated, wise, experienced, private, and doesn’t mind isolation. They prefer it because it helps them gather their thoughts and to gain a more logical view of their problems. They are diplomatic and willing to teach others what they’ve learned, and people come to them for worldly and diplomatic advice and solutions. This is my most favored card – my life path card – and it also matches my Virgo Moon ? 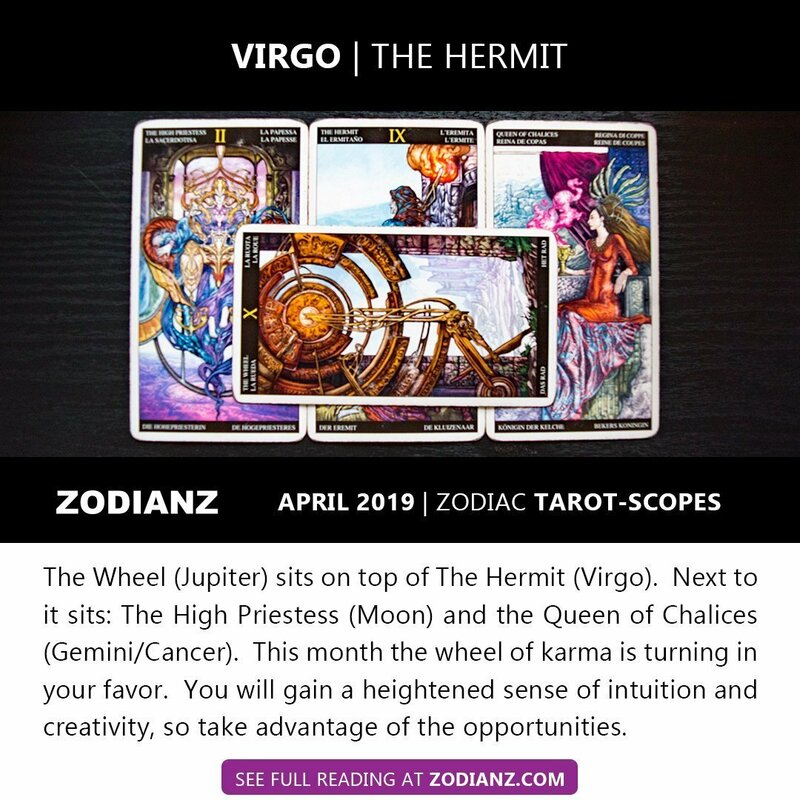 The Wheel (Jupiter) sits on top of The Hermit (Virgo). Next to it sits: The High Priestess (Moon) and the Queen of Chalices (Gemini/Cancer). This month the wheel of karma is turning in your favor. You will gain a heightened sense of intuition and creativity, so take advantage of the opportunities. This month the wheel of karma is turning in your favor. The Wheel compliments you, letting you know that the wheel of karma is balancing itself out. If you’ve been good lately, then expect this month to be a productive and opportunistic time for you. If you’ve been bad, then expect the opposite. There is a sense of great work that needs to be achieved or will be accomplished this month, so invest your energy wisely. The Queen of Chalices and The High Priestess work together, letting you know that your mind and heart will be work as one. Take advantage of your heightened senses, as it will influence your creative work as well as any spiritual work. You will rise above others this month, or at least you should. If you find yourself in a fog, then take time to meditate and open up your 3rd eye. Get woke and get to work. Justice: Like Libra, this card balances the scales of Justice. There is always a need to balance work and play, day and night, good and evil. Like a tightrope walker, Libras are always trying to keep it together in one solid line. However, there are plenty of Libras who like to tip the scales. Regardless, most Libras are fair, harmonious, positive, and uplifting towards others – they love to help others and will always spot potential in people (good or bad). 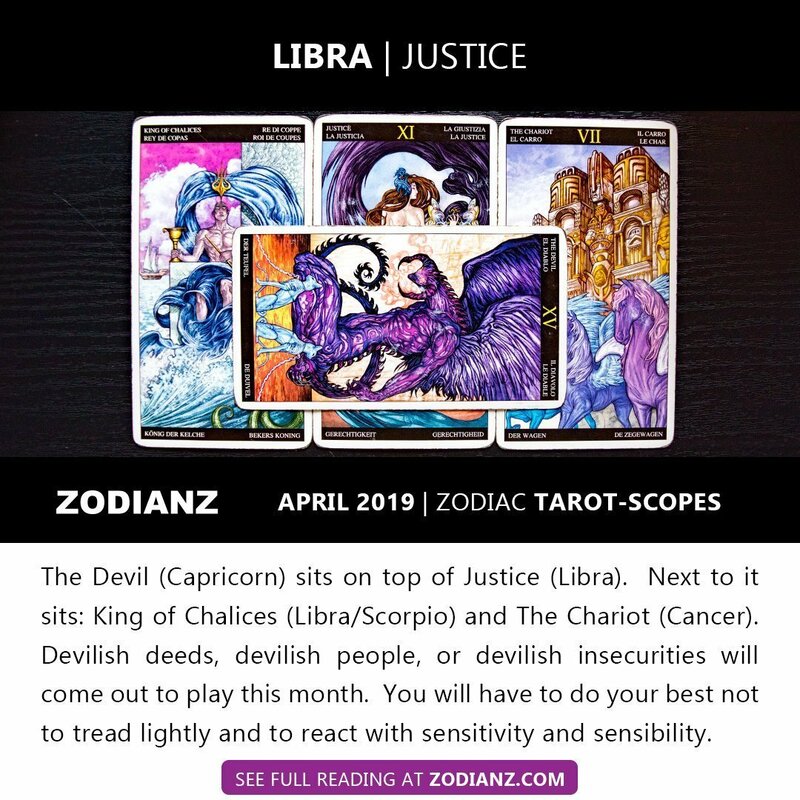 The Devil (Capricorn) sits on top of Justice (Libra). Next to it sits: King of Chalices (Libra/Scorpio) and The Chariot (Cancer). Devilish deeds, devilish people, or devilish insecurities will come out to play this month. You will have to do your best not to tread lightly and to react with sensitivity and sensibility. …do your best not to tread lightly and to react with sensitivity and sensibility. The Devil crosses you, warning you will come across a lot of dark energy this month – either you’re attracting it, or people will come and offer and tempt you with it. You will have to do your best to feel out any situation and to make sure you don’t fall victim to it. People may want you to come out of character and talk about a situation openly, only to use it against you later. Be wary of people who say they’re your friends but are really frenemies. Don’t lower yourself to fit in. Rise above it. The King of Chalices advises you to use both sensitivity and sensibility. Don’t overreact on a personal situation and don’t try to be in the middle of someone else’s drama either. The Chariot predicts that your friends and family will expect a lot from you. React justly and offer sound advice, but don’t invest so much energy that you lose yourself in the drama. Death: Like Scorpio, this card isn’t as dangerous as it reads. In fact, the death card is the symbol of rebirth and transformation. Scorpios are naturally progressive in thought and soul. They are very secretive but it’s because they don’t like to release venom into the world. If they have anything positive to say, they’ll say it. If they have anything negative to say, they’ll throw it away. They have higher beliefs of karma, so though they don’t trust people, they’ll trust their intuition and know that things will just work themselves out over time. 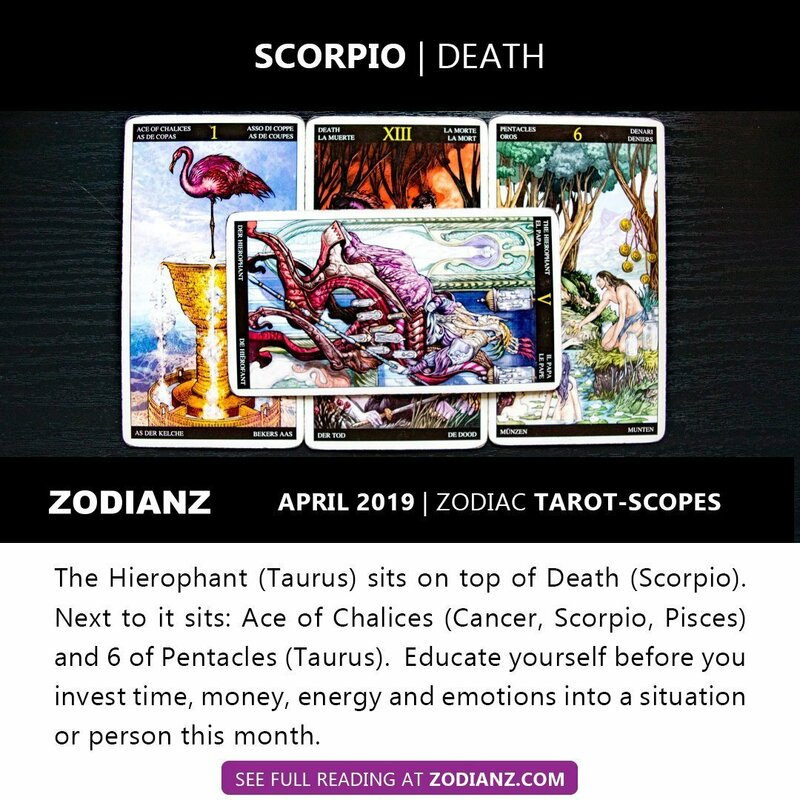 The Hierophant (Taurus) sits on top of Death (Scorpio). Next to it sits: Ace of Chalices (Cancer, Scorpio, Pisces) and 6 of Pentacles (Taurus). Educate yourself before you invest time, money, energy and emotions into a situation or person this month. The Hierophant compliments you, letting you know that you will need to or that you will seek higher guidance, spiritual insights, and/or educated and realistic information before making any life-changing decisions this month. You will find yourself being more narrow-minded than usual, so remember to seek advice from people that have your best interest. Try to readjust yours thoughts and feelings because your trust issues could distract you from the truth of a situation. Ace of Chalices and 6 of Pentacles predict that you will have both love and money on your mind. Meaning, you are encouraged to love and give freely this month, but not to the point where you’re making it rain just to show off or gain acceptance. Remove yourself from the superficial and ask yourself if this person or situation is worth investing your energy and emotions. Can this last forever or is this just a temporary fix? Temperance: Like Sagittarius, this card represents the merging of two energies. The Centaur, Sagittarians symbol, is half-horse and half-man. They can be a walking contradiction and over indulge on their desires, so there is a need to have a temperance within the mind, body, heart, and soul. Meaning, Sagittarians are go big or go home types of people, they require more efforts in self-discipline and resisting temptations. 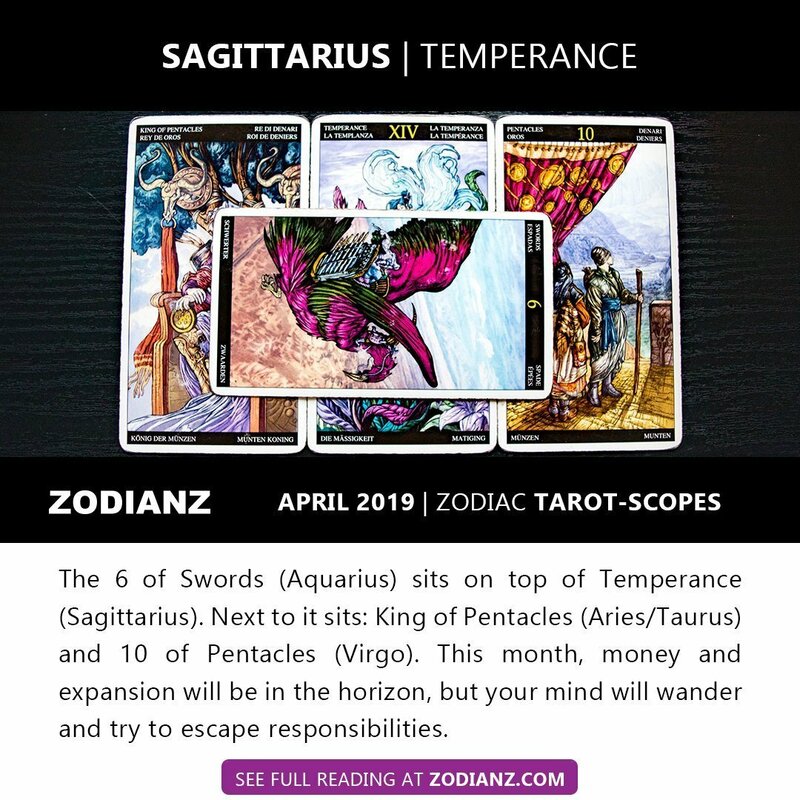 The 6 of Swords (Aquarius) sits on top of Temperance (Sagittarius). Next to it sits: King of Pentacles (Aries/Taurus) and 10 of Pentacles (Virgo). This month, money and expansion will be in the horizon, but your mind will wander and try to escape responsibilities. …your mind will wander and try to escape responsibilities. The 6 of Swords crosses you, warning you that your motivation for the physical realm will decrease. Meaning, you will find your mind wandering or trying to escape from reality and responsibilities. You are getting sick of mundane routines and it’s starting to show. Perhaps you’re losing motivation because you’re not in a job or career that provides it. Try seeking a creative outlet to regain energy before your passions burn out completely. The King of Pentacles and 10 of Pentacles also predicts that your soul needs expansion – it needs something new. Your soul may be telling you that you’re done here, or it could be the universe forcing you out of a situation and you just refuse to leave it. Don’t get stuck in the same dance forever, try switching it up, adding a new step into your schedule, or just pick up and start fresh somewhere else. Up to you. The Devil: This card depicts sin and earthly temptation. Like this card, Capricorns are aware of what the world can offer, but they can also fall victim to the sins and temptations of it. The façade that one can carry can put a lot of weight on them: If it feels good, then it must be good. If it brings happiness, then it must be happiness. This is the lessons of a Capricorn who is always wanting more and to show the world that they have earned everything they have. However, that doesn’t mean they’re all like this. Once they’ve learned the meaning of their lives, they can build a strong defensive tower that fights off all sin and temptation. 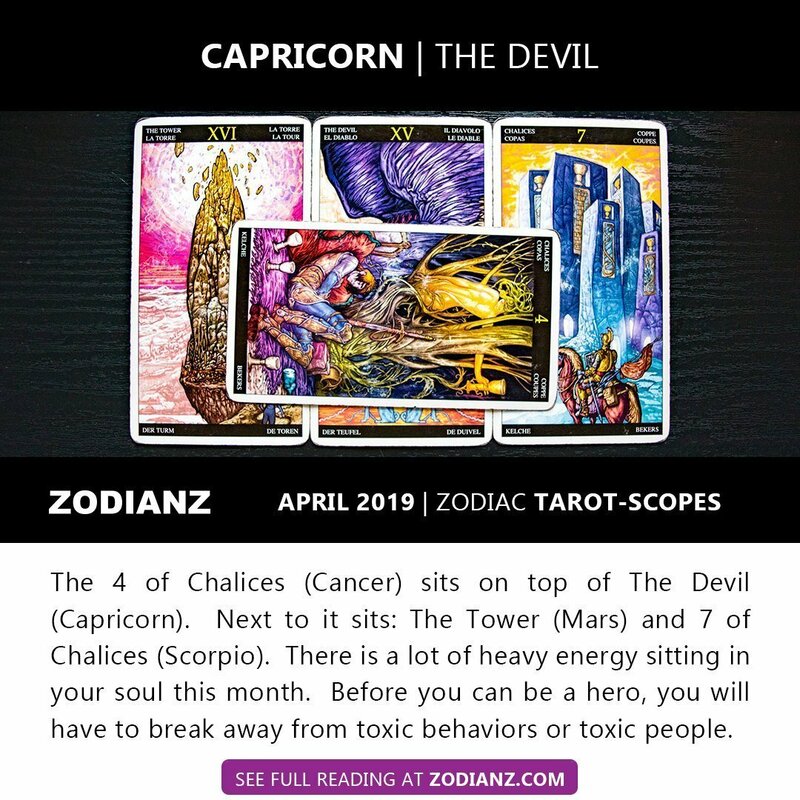 The 4 of Chalices (Cancer) sits on top of The Devil (Capricorn). Next to it sits: The Tower (Mars) and 7 of Chalices (Scorpio). There is a lot of heavy energy sitting in your soul this month. Before you can be a hero, you will have to break away from toxic behaviors or toxic people. … you will have to break away from toxic behaviors or toxic people. The 4 of Chalices crosses you, warning you that you will be in your feels this month. Perhaps the world is getting too heavy for you, or perhaps you’ve gotten way over your head in a situation or with a person. If emotions are weighing you down, then embrace it fully and open yourself up to healing. The Tower confirms that you will have to tear apart your world to make space for a new one. This intensity could be the reason why you’re just not in the mood for anyone or anything. However, notice the knight in the 7 of Chalices. See how it rides in towards the cards to save the day? This will be you at the end of the month. You will have multiple opportunities to be the hero of your own life or in someone else’s. Remember, any achievements (big or small) are good achievements. You can turn this heavy energy around by drinking from a cup (a goal) each day. Just press start. The Stars: Like Aquarius, this card is all about direction, guidance, and higher and revolutionary ways of thinking. Like a mother caring for her children, Aquarians treat everyone with love, care, and respect. It’s one of the main reasons why this sign is often referred to as the Humanitarian. They follow the beat of their own horn, and they are very good at following their own intuition and looking to themselves to always do the right thing for others. 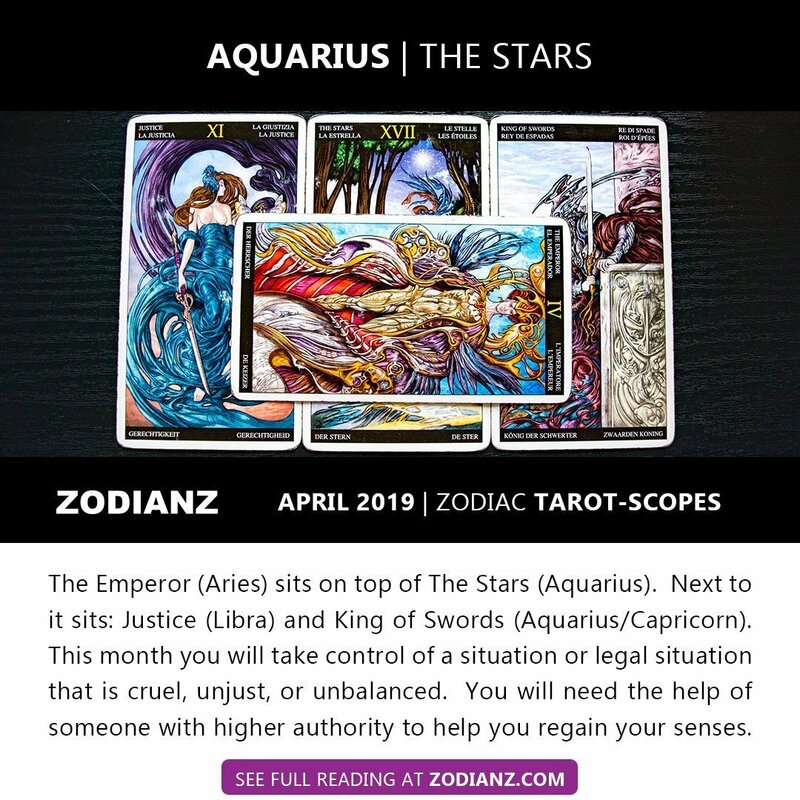 The Emperor (Aries) sits on top of The Stars (Aquarius). Next to it sits: Justice (Libra) and King of Swords (Aquarius/Capricorn). This month you will take control of a situation or legal situation that is cruel, unjust, or unbalanced. You will need the help of someone with higher authority to help you regain your senses. The Emperor crosses and compliments you, letting you know that you will need to empower your senses this month. There is a sense of injustice or unbalance in your household, work space, and/or your sacred space. The Justice card predicts that it’s something or someone that is bound to you legally, or where a vocal commitment was expressed. You will have to remove yourself emotionally and start keeping tabs/evidence of any wrongdoings this month. There is a sense that if you try to jump ship without sufficient evidence, then you will suffer some kind of repercussion for it. Act smart. The King of Swords also encourages you to seek realistic advice. Whether it’s an actual legal issue, a business contract, or just a tight commitment or relationship that no longer benefits you, you will need to clear this out by seeking advice from someone of authority or with more experience in dealing with these types of issues. Remember, it’s okay to say you need help. Don’t be too proud. The Moon: Like Pisces, the moon card is full of hidden surprises and deep secrets and mystery. It is also the card and sign of sensitivity, compassion, though it holds a dark side. Pisces, the double fish, is constantly battling with their emotions. To stay afloat, they’ll need to dive deep within themselves and put in a lot of effort to get rid of negative energies and emotions that influence them. Thus, their battle in life, to fight both the good and bad within themselves. Once they choose a side, it’ll be easier for them to influence others (good or bad). 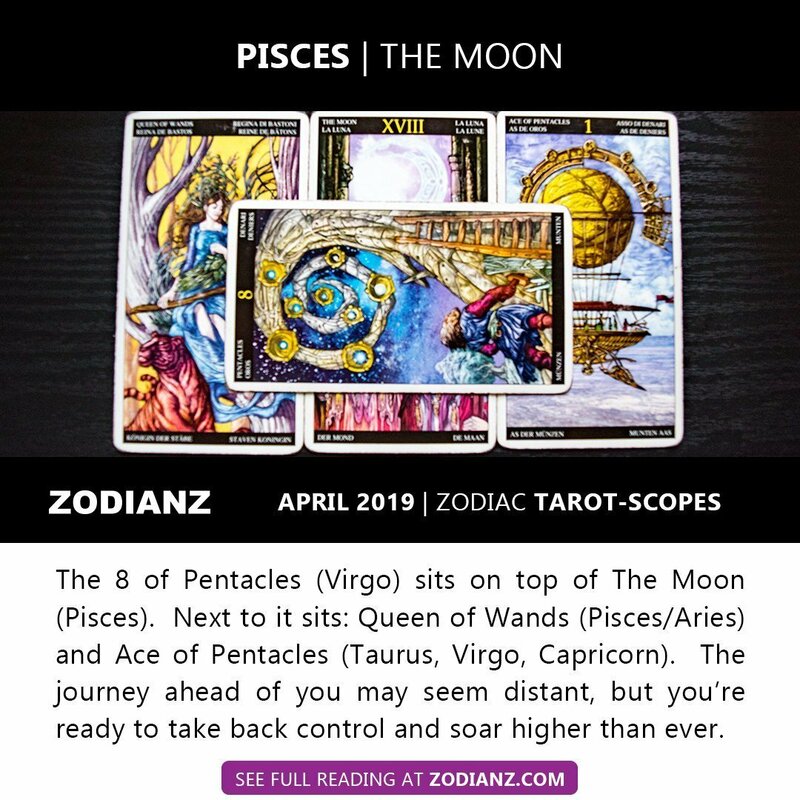 The 8 of Pentacles (Virgo) sits on top of The Moon (Pisces). Next to it sits: Queen of Wands (Pisces/Aries) and Ace of Pentacles (Taurus, Virgo, Capricorn). The journey ahead of you may seem distant, but you’re ready to take back control and soar higher than ever. … you’re ready to take back control and soar higher than ever. The 8 of Pentacles compliments you, letting you know that you are on the right path and that you’re realistic about the journey ahead of you. You may sense that it’s a long one and maybe you’re tired, but you’re still motivated to get the job done no matter what. Notice how the image itself is a bit fuzzy, take it as a spiritual sign. Your intent may have been blurry, or it’s still blurry, so try and clear it away by reflecting and meditating on what you need to do. Shake off the ash of Mercury’s most recent Retrograde, lol. If you’ve been feeling unstable lately, then you’re in luck this month. The Ace of Pentacles predicts that you will be headed in a new direction financially, new career, new education and/or new investment. The Queen of Wands encourages you to move forward with head held high, but to also be sensitive to others where it’s needed. You don’t want to keep racking on bad karma for yourself. Be at peace with situations and just stay in your lane and out of people’s drama.